Some of these make more sense ("Peter Parker, Photographer, The Daily Bugle") than others (would Natasha Romanoff really have the need for business cards? ), but The Vocations of Heroes & Villains is nonetheless an art print that's quite fun to look at. Created by (and for sale at, in signed/numbered form) Pop Chart Lab, the poster imagines what beloved comic alter egos might be carrying in their wallets for, y'know, heroic or sinister networking opportunities and such while out of costume. 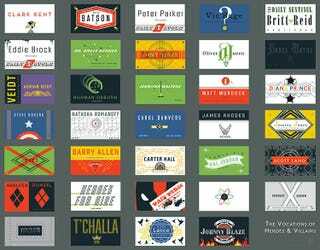 This print imagines the business cards of famed comic alter-egos, from Clark Kent to Tony Stark to Bruces both Banner and Wayne — as well as a slew of notable CEOs (Green Arrow, Green Goblin), mallet-wielding psychiatrists (Harley Quinn), and patriotic military personnel (Captain America, War Machine). The credentials of over 30 secret identities are featured here — all beautifully designed and hand-illustrated — to form a brave, bold, and business-casual rolodex that makes for an uncanny addition to your wall. Here's a close-up. Bruce Banner's is pretty cool, we have to admit ... appropriate color choice, too.